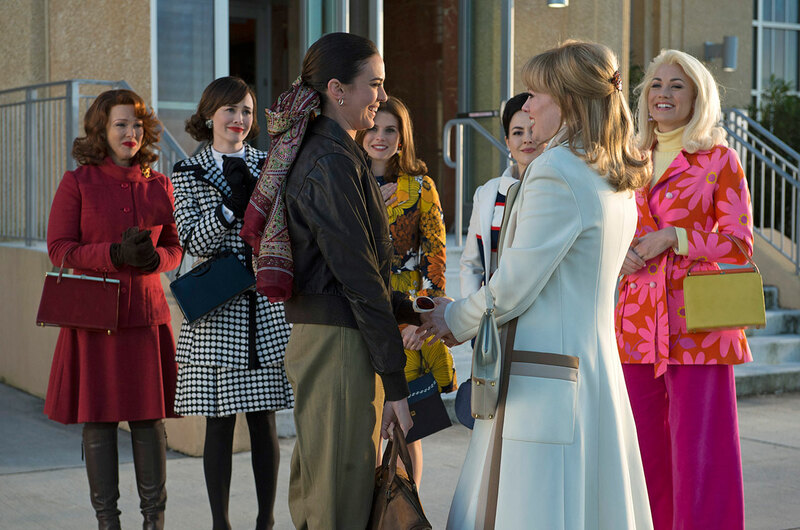 – The spouses of America's first spacemen flew off into the sunset on Thursday night (Aug. 20) — or at least one of them did — on the final episode of ABC's "The Astronaut Wives Club." The tenth hour of the ten-part docudrama, titled "Landing," was set between two of the most famous space missions in history. "It is 1969, and Apollo 11's historic moon landing is cause for worldwide celebration and a high point for the Astro-families," ABC described in its synopsis for the final week of the summer event series based on author Lily Koppel's bestseller by the same title. "The wives are interviewed for a television documentary on the space program, Gordo is passed over for the next mission, and Trudy faces some big decisions about her personal and professional future. Betty finds a powerful way to honor Gus's legacy and [to] advocate for change. In April 1970, the nation watches the fraught voyage of Apollo 13." 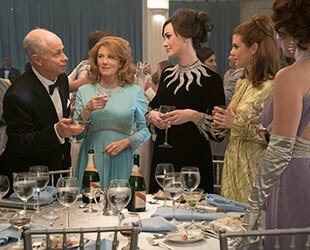 The episode stands out for a noticeable inclusion: the only real-life member of an "Astro-family" to make a cameo on the "Astronaut Wives Club." Rosemary Roosa, daughter of Apollo 14 command module pilot Stuart Roosa, appears at the gala celebrating Apollo 11's success. The episode ends with a postscript montage summarizing what became of the Mercury 7 wives (and their husbands). Only three lived to see the series air: Annie Glenn, Rene Carpenter and Betty Grissom (John Glenn is the last living Mercury astronaut today). Post-mission debriefing: Here's a look at where the finale, "Landing," settled on the real space history ("A-OK!") and where it veered off course ("ABORT!"). "I've wanted to be you." Alan Shepard (played by Desmond Harrington) bumps into his boyhood hero, Charles Lindbergh (Christopher Jenkins Holmes) as he waits to see the Apollo 11 launch. A-OK! The Shepard family was in the VIP viewing stands when the first aviator to fly non-stop across the Atlantic introduced himself to the first American astronaut in space. As the episode makes mention, Lindbergh was Shepard's personal role model from a young age (the future astronaut was three years old when Lindbergh landed in Paris). The two had met briefly before but on this occasion they wandered off and compared their experiences before standing together to watch astronauts depart for the moon. Shepard later described the meeting as "the most exciting moment of my life." Wally Schirra (Aaron McCusker) takes to the TV anchor desk as a commentator during the Apollo 11 and Apollo 13 missions. A-OK! After commanding Apollo 7 and retiring from NASA, Schirra was indeed hired as a consultant to CBS News, joining journalist Walter Cronkite on the air for what he dubbed "Walter-to-Walter" coverage of the moon landing missions. "Lean on the astronaut thing." John Glenn (Sam Reid) campaigns to become a Senator representing Ohio, but downplays his role as an astronaut. A-OK! As Glenn wrote in his 1999 memoirs, "I was not running as the first American to orbit the Earth." In May 1970, a month after the Apollo 13 mission, Glenn lost the Democratic primary. Four years later when he ran again, Glenn defended his prior job as an astronaut during a final debate, cinching him the nomination. Black college students and others protest outside a gala celebrating the Apollo 11 moon landing. ABORT! 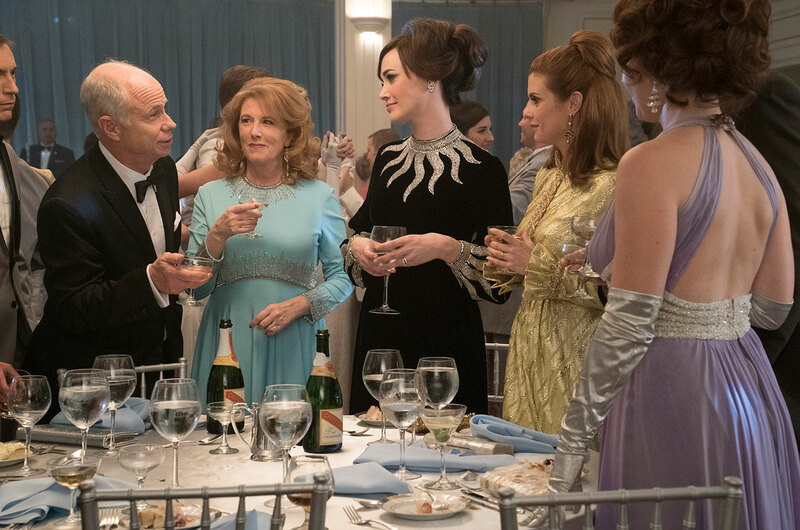 Setting aside that the episode's version of the Aug. 13, 1969 state dinner honoring the Apollo 11 crew at the Century Plaza Hotel in Los Angeles was seemingly absent anyone playing astronauts Neil Armstrong, Buzz Aldrin and Michael Collins (or for that matter, their wives), the show replaces one protest for another. The Associated Press reported the next day that outside the hotel, "several thousand demonstrated peacefully against the war in Vietnam," not income inequality or civil rights, as depicted. "They waved signs and chanted, 'Stop the war' and 'Power to the people.'" As for the episode's protest, the poem the students are chanting, "Whitey on the Moon" was a track off Gil Scott-Heron's debut album, "A New Black Poet: Small Talk at 125th and Lenox," released in 1970. Coming over to confront Alan Shepard and Deke Slayton (Kenneth Mitchell) about her husband being pulled off Apollo 13, Trudy Cooper (Odette Annable) is disappointed to learn of Gordo's priorities, or lack thereof. A-OK! Shepard's return to flight status (after having surgery for Ménière's Disease) resulted in Slayton breaking the flight rotation, which otherwise would have assigned Gordon Cooper to command Apollo 13. But even without Shepard, there were concerns about Cooper's performance that kept the Mercury and Gemini astronaut from the moon. "...he never put really put his heart into training and seemed to spend a lot of his time more interested in racing cars," Slayton said in his 1994 biography, "DEKE!" written with Michael Cassutt. "He had not done a very good job as the backup commander [of Apollo 10] — not good enough to change anyone's mind." Interrupting what is meant to be a cooking segment, Rene Carpenter (Yvonne Strahovski) demonstrates how a diaphragm works on live television. A-OK! ...and ABORT! Rene really did debut her TV show about women's issues, "Everywoman," with a feature about birth control, including showing off a diaphragm. That show however, aired in 1972, well after the events depicted on "The Astronaut Wives Club." And she didn't push aside a pineapple cake to do it; "Everywoman" from the start was planned to tackle controversial topics. That same debut episode also included a natural birth filmed at a local hospital. Betty Grissom (JoAnna Garcia Swisher) shows up with her lawyer to join the wives watching the on-going Apollo 13 mission coverage. Betty explains she is going to sue North American Aviation to hold them responsible for the Apollo 1 fire that claimed her husband, Gus. A-OK! ...and ABORT! Betty Grissom filed a total of four lawsuits against NAA, the prime contractor for the Apollo command module, in January 1971. Two of the cases filed in Florida were on her own behalf and two filed in California — where the spacecraft had been built — were for her two sons. Ultimately, she settled out of the court for $350,000. On the show, Betty remarks, "I don't care about the money, I want them to admit they're responsible." But in her own book, "Starfall," published in 1974, the real Betty Grissom states that she decided to sue after the remaining astronaut couples excluded her from sharing in the proceeds from a television documentary being filmed about the spacemen and their families. "I realized right then that the astronauts didn't give a damn about the widows," she wrote. 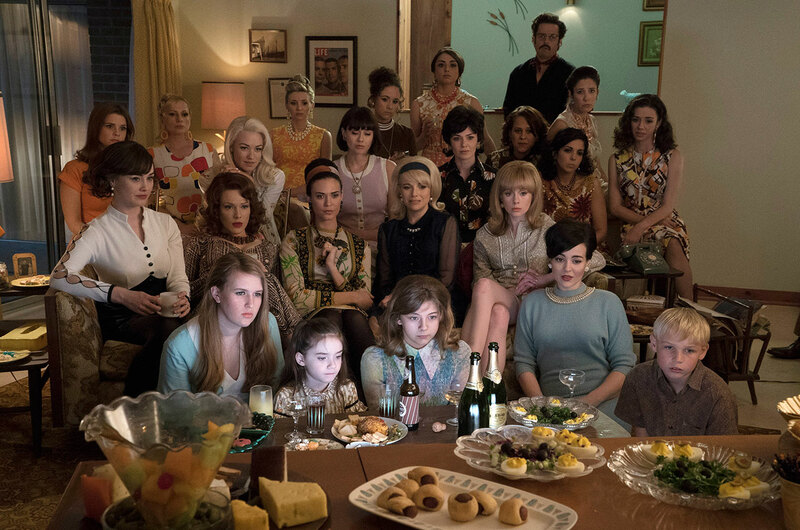 The wives, and the world, wait for word that the Apollo 13 crew has been able to lower the high carbon dioxide levels in their crippled spacecraft. A-OK! 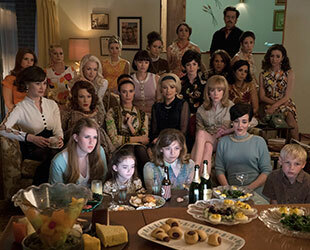 Perhaps to separate itself from "Apollo 13" starring Tom Hanks, or perhaps to evoke one of the 1995 movie's more famous scenes, "The Astronaut Wives Club" chose to focus the drama on the need to fit a "square peg in a round hole" rather than the "Houston, we've had a problem" in-flight explosion that began the effort to save Apollo 13. Almost immediately after it became apparent that the crew would need to use their lunar module as a lifeboat, engineers in Mission Control realized that they would need to devise a solution to scrubbing carbon dioxide from the air. The moon lander used cylindrical lithium hydroxide (LiOH) canisters, while the astronauts only had access to their command module's supply of square canisters. The solution, which involved duct tape and a sock, was pieced together in a matter of hours, and then was called up to the crew, who worked to construct the jerry-rigged device. The problem did make headlines and the TV news reports, but the timing of the fix and the immediate severity of the problem wasn't as dramatic as either the show or the previous movie showed it to be. In fact, the astronauts were ready with their makeshift canister before the last cylindrical canister needed to be replaced. The postscript states that out of the 30 NASA astronaut couples who flew on the Mercury, Gemini and Apollo flights, only seven of the original couples stayed together. ABORT! It is not clear how the show arrived at its tally, but even excluding those lost to death during the program (for example, Betty and Gus Grissom), there were 11 couples who were married before the astronauts flew into space and remained together through present day (or until one or both died). Among the Mercury 7 astronauts, Alan and Louise Shepard, John and Annie Glenn, and Wally and Jo Schirra remained married. Among the Gemini and Apollo program couples, the following were or are still married: Bill and Valerie Anders, Frank and Susan Borman, Michael and Pat Collins, Charlie and Dorothy Duke, Ronald and Jan Evans, Jim and Mary Irwin, Jim and Marilyn Lovell, and Stu and Joan Roosa.